These bannocks are more like a dry scone in consistency and are easier to make than the Selkirk bannock – for a start, you don’t have to worry about leaving it to rise or kneading the dough for ages. Although they’re called ‘Fife’ bannocks, like the Selkirk bannock they are in fact made across Scotland now. 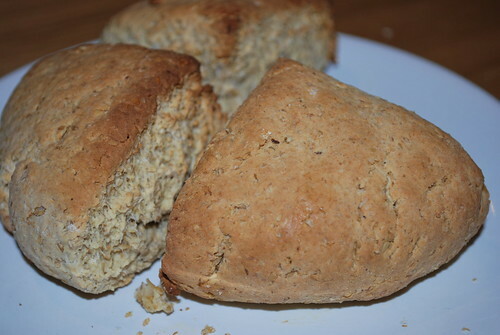 The Fife bannock, along with the Brodick bannock, is one of my go-to varieties that I like to make. I choose to make this one when I’m looking for something more savoury than sweet. Because there’s no fallaid with this type of bannock, you could designate a farl as the bonnach fallaid (to keep away unwanted attention from the Good Folk) if you want, by either putting a hole through the dough with your thumb, burning it as it cooks, or simply break off a piece and leave it for them as an offering. 1. Heat the oven to 220C/425F/gas mark 7 (or preheat the girdle, if using), grease a baking sheet, and lightly dust a clean surface with flour, ready for the dough for later. 2. Put all of the dry ingredients into a bowl, then rub in the butter with your fingertips. 4. Turn the dough out onto the floured surface and knead lightly for a few minutes, adding more flour if needed to prevent sticking. 5. Press or roll the dough into a round shape, about 3/4in thick (or 1.75cm). 7. Bake in the oven for 20-25 minutes (for four farls, allow less time if you cut the round into more), or until the bannocks are a light golden brown. Alternatively, bake them on a hot, greased girdle. If you use caudle, you will need to turn the farls over and apply a thick coat to the underside once the first layer of caudle has dried in the heat of the oven. This should take about five minutes. You can keep applying layers of caudle to alternate sides as the bannocks cook if you wish. 8. Cut the farls in half and serve them with butter and jam, or butter and sheep’s cheese. 1 Ingredient quantities taken from H J Dobson, Scottish Country Recipes: Traditional Fare from Hearth and Home, p37.